Nuaire has a dedicated BIM team offering libraries of CAD/Revit/BIM files to a customer's exact specification. Nuaire's visually accurate models offer collision detection through geometry, connection positions, weights and electrical loadings. Project-specific performance criteria and support for design, project management and building operations can be requested which will result in improved design efficiency. The majority of our Revit files are modelled using the ‘type catalogue’ method giving a much more efficient workflow for the user and offers the entire range of units within a single parametric model file. 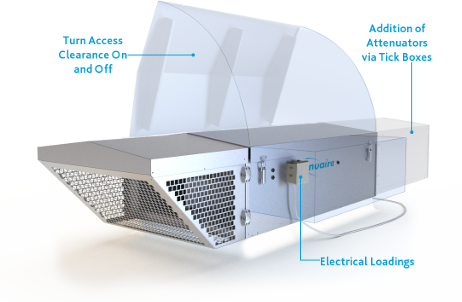 Many of the models below offer additional, user-controllable features like the automatic addition of matched silencers, showing/hiding access clearance areas, amongst others. If you can’t find what you are looking for or for any other BIM/Revit enquiries please email: bim@nuaire.co.uk. A same-working-day response is usually achieved.